Hi, my name is Melody Lambson. I have been a member of L'Chayim for about 3 years and am now the President. I love to quilt and I have a fetish for fabric. I would come here just to play with fabric even if there was no sewing allowed. I have learned to make fabric yoyos and put them on old skirts and jackets to repurpose them. Did I mention I love to repurpose things? I also crochet and since I don't believe in throwing away fabric or scraps, if I can't make quilts or yoyos out of it, I can always crochet it and make scrappy rugs. I love L'Chayim. I have made a lot of great friends here. L'Chayim is a great bunch of ladies on a mission to repurpose. They take things that even thrift stores throw away and make those things into stuff people can use and much of it actually give away to people who can use it and don't have enough money to buy the necessities they need. My name is Angel Morgan. I have been volunteering at L’Chayim of Galt, Inc. since November of 2005. Gloria Stemler recruited me to help the ladies of Meadows Depot learn to cook and sew. I have been here working toward these goals and all other community service projects. I have served on our board of directors and held several officers positions. I believe in the work we do here in our community. I have learned skills I never thought I would and enjoyed most of it. Gloria Stemler is my name and bag lady is my game. Seriously, I am the founder of L’Chayim which has been in existence for about 30 years. L’Chayim was incorporated into its present form in 2005. I am still a board member. I have a passion for the homeless and hungry. I make quilts and toiletry bags for the homeless. I also coordinate the yearly walnut project. We pick, crack, sort and sell the nuts. Project proceeds go to help keep the doors open and the operation of L’Chayim going. Hello! My name is Bettie Giles. I have been with L’Chayim for about 2 ½ years. I crochet for the ladies of L’Chayim, things that come in unfinished and donated. I try to finish them. Things like afghans for adults and babies. I also crochet new things such as Christmas ornaments and clothing. 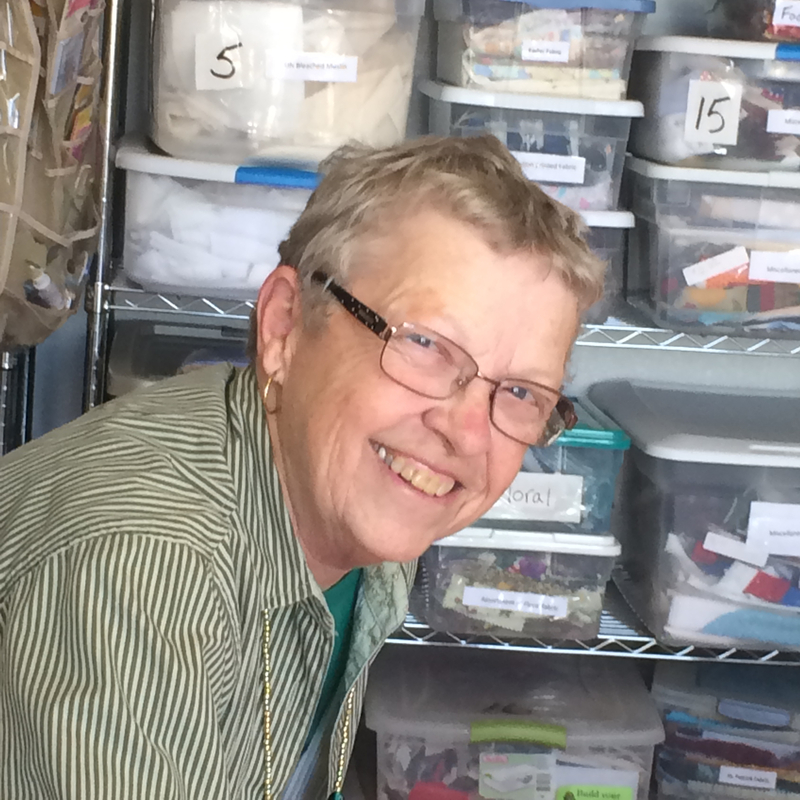 I am also taking the quilting class from Sheila Stepp! It would be hard to say what my favorite thing to do is because I find fun in most everything I have done!